Save SAR 0 (0%) Earn 16 Shukrans What is Shukran? Shukran is the Landmark Group’s award-winning loyalty programme in the Middle East, which allows you to earn Shukrans when you shop any of our brands. Gift this beautifully striped sleepsuit with embroidery detail and back button closure to your newborn baby and provide the desired comfort. The featured closed feet design helps to keep her snug all day long. 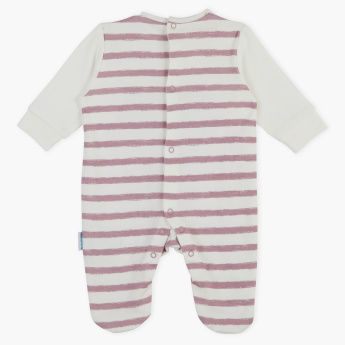 Features : Close feet sleepsuit with stripe pattern and designed accordingly with looks of dungaree .